Colt 33 a ladies' watch supersport. Sports, bold, elegant, Colt 33 reflects the image of the woman who "wears" Breitling. Sports, bold, elegant, Colt 33 reflects the image of the woman who “wears” Breitling. 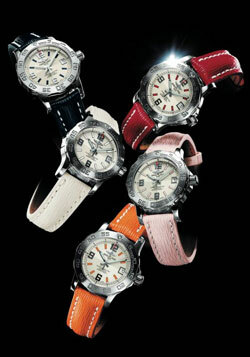 Here is an original collection that offers a new and exclusive leather bands characterized by bright colors. With a diameter of 33 mm and the unique design, combined with its unique technology, the Colt 33 was first introduced in 2011. In just one year has managed to conquer the heart and pulse of women demanding that require performance beyond the aesthetic beauty of advanced techniques. Today Breitling offers it in new versions of the brand new look, with fine leather straps Sahara fresh and dynamic colors – red, blue, pink, orange, white – which you’ll tune indexes applied on the dial. On the unusual case stands entirely smooth bezel, with frosted surface and hollow figures. Upon request, the bezel can bring gems. The three large digits 6, 9 and 12, the rounded design, all the hours on the plot quadrants refined. On the technical Colt 33 has all the qualities of a professional tool for Breitling: a move is a Caliber SuperQuartzTM – ten times more accurate and provided with ordinary quartz chronometer certificate issued by the COSC (Swiss Official Chronometer Control). The crystal is scratch-resistant sapphire crystal with antireflective treatment on both sides, screw-down crown to ensure a robust steel case waterproof up to 500 m.
The new Colt 33 with indices in color and is available with metal bracelet from the links arranged in three rows. Strap / Bracelet: leather or metal bracelet Colt Sahara.